Become a Parent Champion Volunteer! Parent Champions are parents who have positive experiences of using services who act as advocates and peer advisers to other parents in their community. Parents are the best people to engage with their local community as they can share their own experience whilst supporting others. Parent Champions can play a vital role because they understand the challenges parent/carers are facing. There are so many variables and dynamics involved in getting any message across in a professional, calm and clear manner. If it were all just about confidence or the way you look and sound, things would be so much easier. Even though all of the above does come into play, there is so much more to communication and getting your message across. I am the parent of a young person with disabilities and I know only to well the importance of getting my message across when it come to dealing with education and service providers. Many parents of disabled or SEN children have some difficulty at one time or another with their child's education. Often the problem is that the nursery, school or higher education just don't know what the law says that they must do for children and young people with disabilities. As a parent it can be very helpful if you already know what the Equality Act says that the school/college must do. This can also help you when you have to talk to a school/college about the inclusion of your child. I have designed and enjoyable course and written this easy to read book for parent/carers so that they can have a better understanding of the Equality Act in education. I know that sometimes it is hard to change old ways of thinking and habits that don’t make our life any easier. This course is about how to live with yourself and thrive. No matter how you are feeling or where you are in your life right now you can give yourself a second chance where you can choose to do things differently. This course is designed to help you become more resilient so you can embrace that change you want to see in your life. 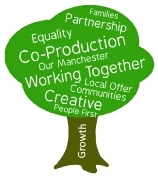 Co-production is when you as an individual influence the support and services you receive, or when groups of people get together to influence the way that services are designed, commissioned and delivered. To put it simply, it’s about the importance of working together, sharing knowledge and co-designing better ways to deliver services with service users, families, and our communities. That is co-production in a nut-shell.